A night guard, also known as a dental mouth guard or a bite guard, is an appliance prescribed to patients to treat teeth grinding (bruxism). In general, it protects the teeth and other vital structures by offering a protective barrier between the upper and lower teeth. The difference between the different types of prescription night guards is in the material used. Over the counter night guards do not offer this option, which is another reason why professionally made night guard are superior. There are three main types of night guards that may be prescribed based on the patient’s need: soft, dual laminate or rigid acrylic night guard. Soft night guard: The soft night guard may be prescribed for mild cases of night grinding or bruxism. There are patients who do not suffer from the unfortunate habit on a nightly basis. There are also patients whose degree of grinding is not so significant. For these patients, a soft protection is enough to solve the problem and preserve teeth structure. The soft night guard is also well suited for people who suffer from teeth clenching rather than teeth grinding. The soft material cushions some of the clenching force. Dual laminate night guard: When the teeth grinding is more severe and you wish for the appliance to be longer lasting, a dual laminate is a going to be a great option. A dual laminate night guard is soft on the inside and hard on the outside, offering more protection and promising more durability. Acrylic night guard: The third and final option for a night guard is a rigid acrylic one. The hard night guard is much more durable. It’s made from acrylic, a clear, hard plastic material. The hard night guard is suitable for people who suffer for heavy to severe teeth grinding. Note that the acrylic night guard differs from an acrylic bite splint. While a regular night guard protects against teeth grinding, the acrylic bite splint is prescribed to a patient to address a TMJ dysfunction. An acrylic bite splint should be obtained directly from the dentist. The acrylic night guard is a rigid appliance. While the design, extent and coverage is similar, the material is much tougher. 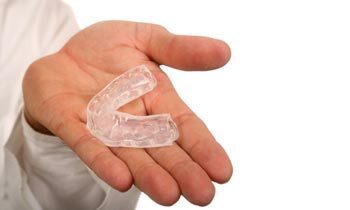 An acrylic night guard can last up to 5 years or more with regular use. Since it may be used for such a long time, it is important to regularly clean and care for your acrylic guard. For more information, please refer to this article on how to clean and care for your night guard. To find out which type of night guard is best for your case, you can go see your dentist for a recommendation. Most dentists will also offer to make you a custom night guard; however, you can get the same quality professionally made custom night guard at ProTeethGuard.com for a fraction of the price.